Mark Metcalf, a Sunderland fan and author of many books, has previously contributed a number of articles for this site, such as detailed profiles of Jimmy Greaves and Bobby Smith, which can be found on the Spurs Odyssey features page. Some new ones will be going online shortly. Mark and a friend have established www.thedribblinggame.com which sells vintage art prints of famous games and players from the past. Two Tottenham Hotspur prints are currently for sale. 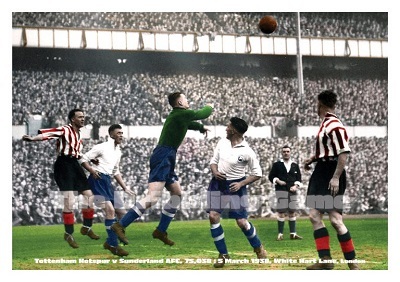 They feature the 1938 quarter final FA Cup tie v Sunderland, which attracted White Hart Lane�s biggest gate, and the home League game on 12 November 1949 that saw Sheffield United thrashed 7-0 with Sonny Walters hitting three. More prints will follow in due course. 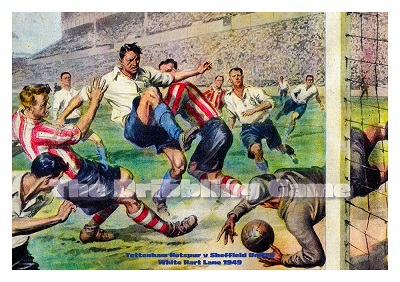 And if by chance you�ve got friends who back other teams there are on the site prints that may interest them.